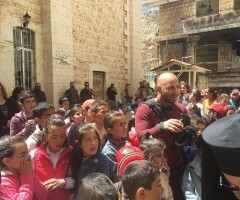 ← What’s really going on in Yarmouk? 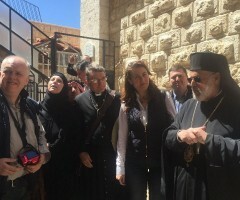 Maaloula is one of the few places on earth where Aramaic is still spoken – the language that Jesus spoke – and it’s home to a very ancient church and monastery. Presumably that’s why it was targeted by the rebels. They came bursting in through a pass in the mountains and captured three men on duty. They ordered the men to convert to Islam. The men refused and were beheaded on the spot. We laid flowers at the place where they fell. 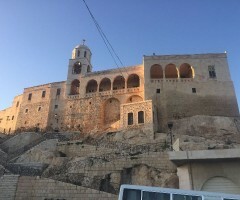 They captured the monastery and used it as a headquarters. 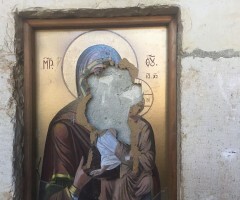 Worship areas were desecrated and they took all the icons, defacing those that couldn’t be stolen. No one knows where the icons are now – quite likely in private collections in Europe. 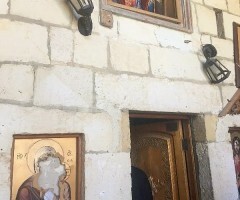 A priest there said to me that they were more concerned about the nuns who were kidnapped – “the real icons of Maaloula”. 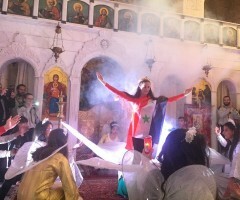 The Syrian Arab Army retook Maaloula. 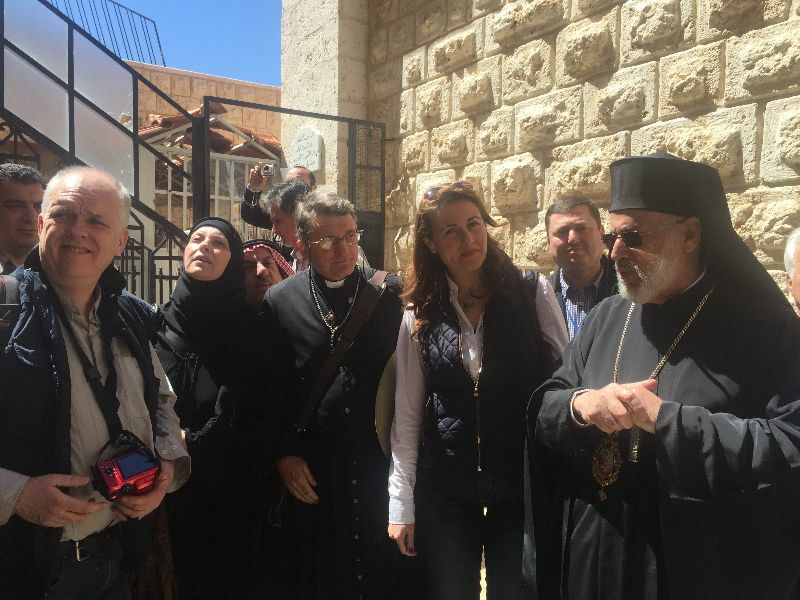 A priest showed me a window in the top of the monastery that had been used by a rebel sniper. He added “he himself was snippered”. I wasn’t sure what he meant at first and then he showed me the splashes of blood around the window-frame. 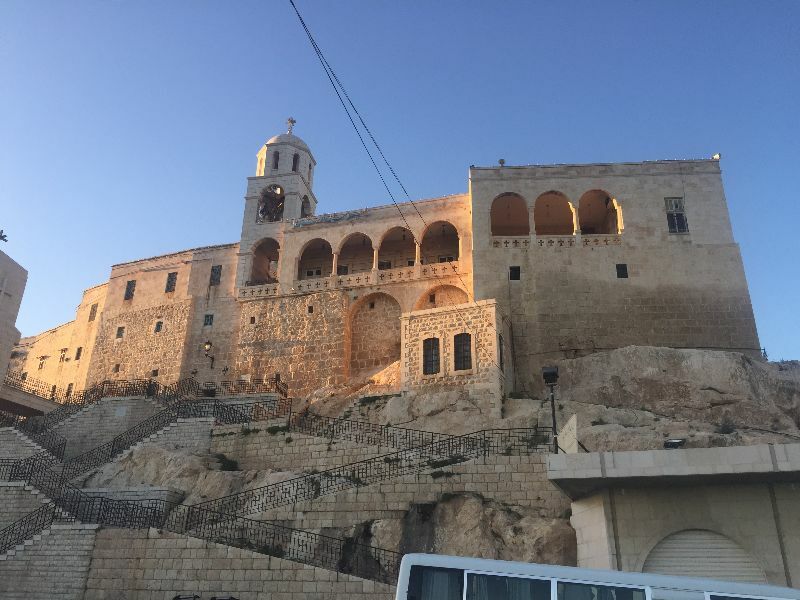 A friend who was with me that day said he’d visited Maaloula earlier, just after it had been liberated by the army before Christmas. He told me how he’d asked some of the kids then what they expected Santa to bring them. One boy apparently replied “I just want my friends back”. Amidst all that pain though there was still enormous beauty. 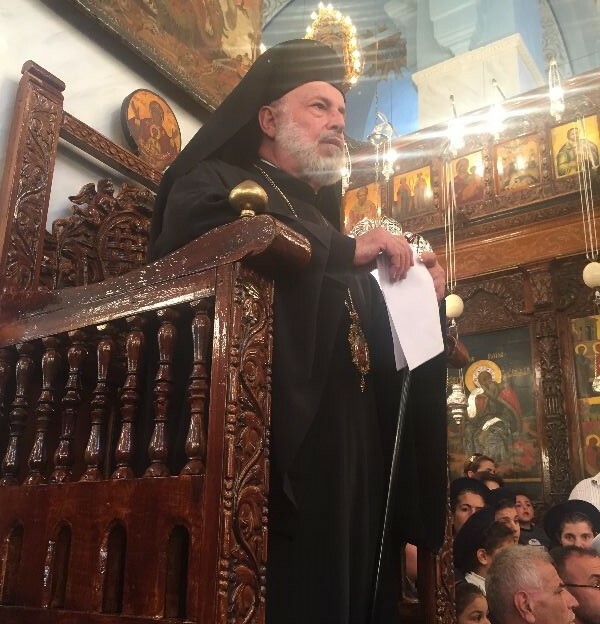 The highlight of my time in Maaloula was standing in the sanctuary of the chapel while one of the woman sang the Lord’s prayer for us in Aramaic! What was also encouraging was the smell of fresh plaster and paint in many of the houses. And on our way out we passed a long line of teenagers walking towards the town, all dressed in blue overalls! They were the volunteer repair team, armed with an impressive array of picks and other building tools. The striking thing about Saydnaya, where we went next, was that the town was teeming with children, and yet they weren’t simply playing causally in the streets! There was a line of about 100 children and adults saluting us as we arrived, and there was a brass band playing, with dozens of boys and girls banging drums and playing trumpets! We couldn’t stay and listen to the band though as we were being hurried along to church. Apparently they’d been waiting for us! All the children that hadn’t been saluting or playing an instrument in the square must have been in one of the choirs we subsequently heard. There was a choir singing in the church and another one started in the square outside the church as the service finished! They sung hymns of faith interspersed with patriotic songs. The church service itself was beautiful, but there was real pain being experienced there too. 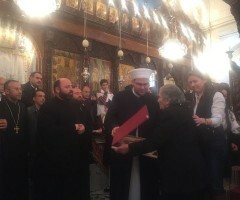 The service centered around a presentation of a number of large icons that were being given out to parents whose children had recently died (mainly as soldiers in the Syrian Arab Army). There were about 40 icons given out! 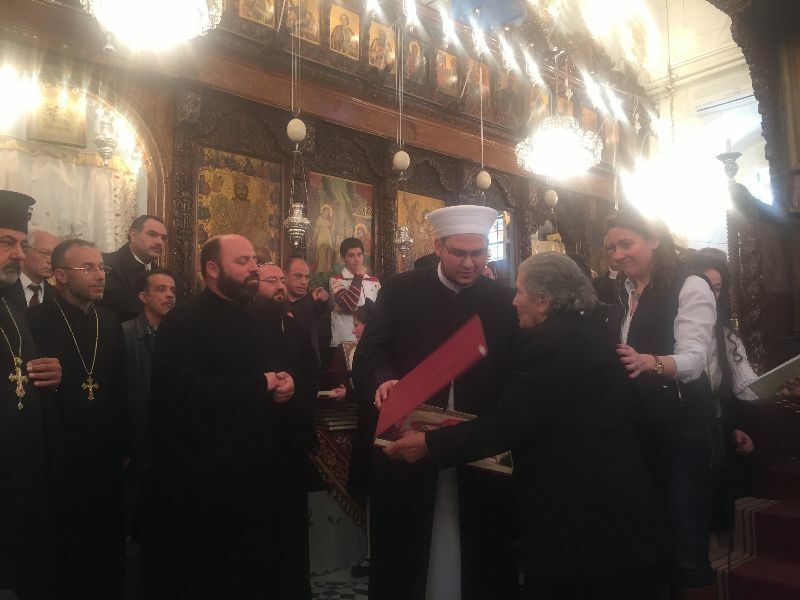 The congregation clapped each time an icon was handed out but the recipients weren’t smiling. 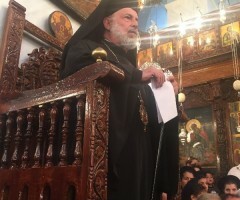 One encouraging aspect of that ritual to me was that the Islamic Sheikh of Saydnaya was one of the dignitaries handing out icons to the bereaved – standing up the front of the church mingled in with the priests and nuns. Clearly this was not about Christianity vs. Islam. It was about the people of Saydnaya vs. those who wanted to destroy their village. As the choirs finished their anthems, a brass band (again made up entirely of children) struck up a stirring tune and led the way to the place where we were having dinner. All the children were in a uniform of one sort or another – choristers and band members and saluters alike! I don’t know if they were Scouts or Guides uniforms or whether it was the uniform of the Saydnaya militia. Even so, those kids looked formidable, and I reckon that if the men of Saydnaya are anything like their children they will be a force to be reckoned with! And they may very well need to employ that force very soon! With the fall of Idlib to the north, there is very little between them and the rebels now. Indeed, there is very little between either of these magical places and the rebels now. 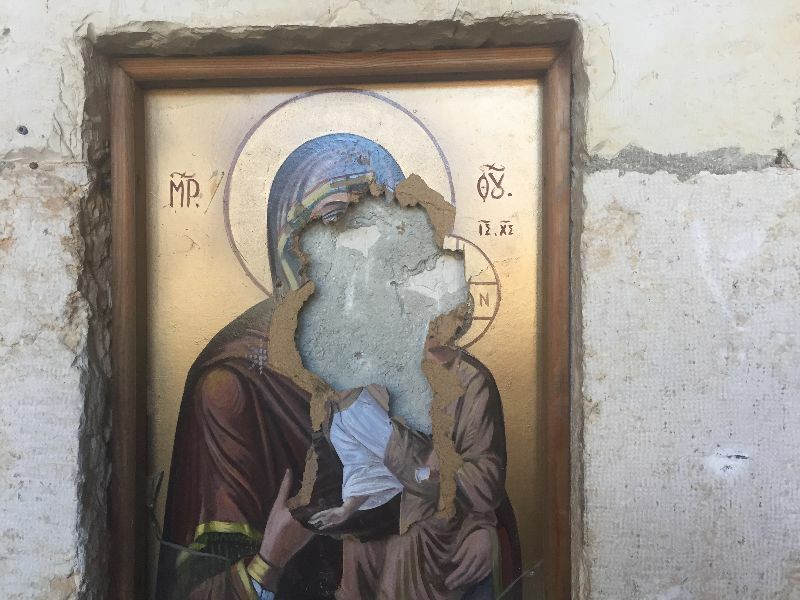 Maaloula has already experienced occupation by Jabhat Al Nusra and they know what they are capable of. Saydnaya has the appearance of being far more ready to repel an attack, and its position in the mountains makes it a natural fortress. Even so, the numbers that come against them could be completely overwhelming. I pray for these people every day. Each of these towns was like a little oasis of youthful beauty and life in the middle of the Syrian desert! 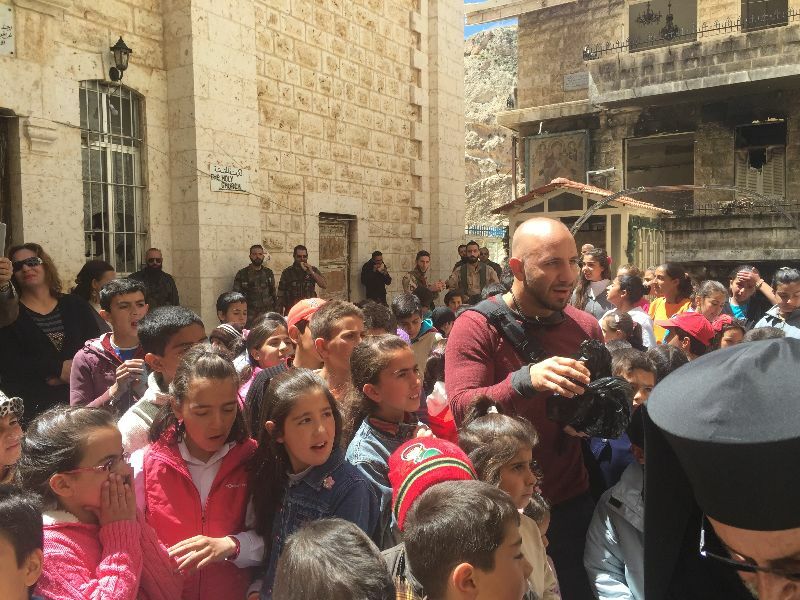 May God protect all the beautiful children of Maaloula and Saydnaya, and their parents. God have mercy on them all! This entry was posted in Uncategorized and tagged Europe, Father Dave Smith, Jabhat al-Nusra, syria, Syrian Arab Army. Bookmark the permalink. 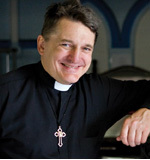 Thank you for this Father Dave! I was there in the 1990s and loved both places so much!!! As you I was loath to leave. I pray daily for them. 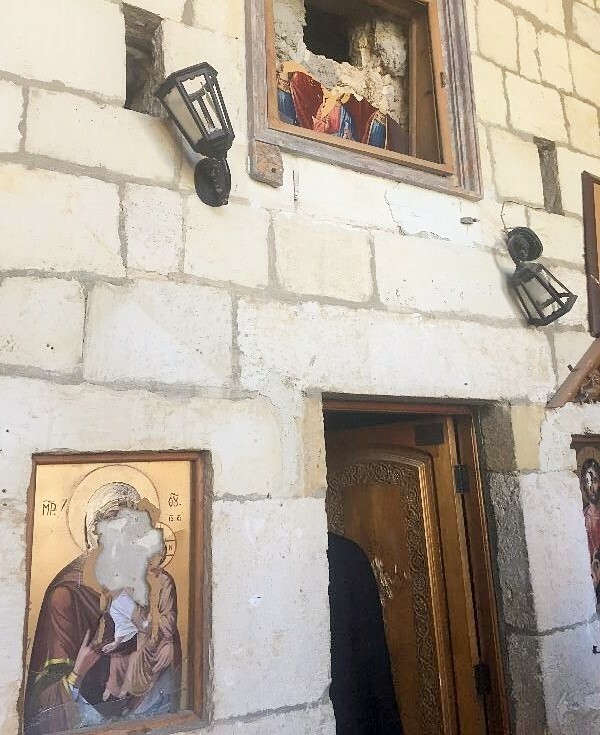 I saw the most beautiful precious early Christian pair of Icons in a monastery in Ma’a’loula and wonder– could they have been saved? ?